SBI PO exam preparation is an uphill task in the beginning but once you get a hang of it, it is as simple to prepare like any other exam. Every year lakhs of aspirants apply for SBI PO exam with the hope to crack it but only a few make it to the top. SBI PO exam preparation cannot be fulfilled by reading books only. While books may be your best friend at the initial stage, moving on you will need some advanced study material like videos, test papers, etc. But before we move on to that part, let’s have a look at the SBI PO exam structure. The Descriptive test will be of 50 marks that need to be answered within 30 minutes. There will be 2 questions, one essay writing, and one letter writing. There are numerous options when it comes to SBI PO study materials. Aspirants can access specialized books, E-books, etc. for their preparation but irrespective of the study material they use, taking mock tests are absolutely necessary. Practicing mock tests are an important part of any exam preparation and every aspirant must utilize it for their own benefits. SBI PO Mock Test Series is a great way to prepare for the exam. 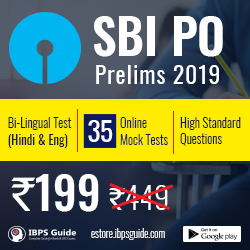 For SBI PO exam, candidates can go for SBI PO Combined Mock Test series that will contain the latest questions from SBI PO Prelims and Mains Mock tests. A combined test series is the best investment for candidates who are confident enough to crack all the rounds in SBI PO exam. Since the exam pattern is different for SBI Prelims and SBI Main exam, different mock tests for both can be purchased as a combo and candidates can start preparing simultaneously with both the test papers. SBI PO Main Mock Test series is the ultimate study material for all the candidates who have already tasted half success by clearing the tough SBI PO Prelims round. Now, these candidates need to give their best shot and qualify the SBI PO Main exam. Although the Prelims exam focuses on basic subjects like English, Math, and Reasoning, the Main round is obviously very subject-specific and tougher than the previous one. SBI PO Main contains sections like Data Analysis & Interpretation and Banking Awareness which means that candidates need to understand every basic of how computer software and programs work along with general banking terms that are used at the bank.